One of the most important forces in SaaS today is the Consumerization of IT. Instead of a centralized IT organization deciding which products to buy, product managers and marketers and engineers and data scientists determine which products they think would serve them best and buy them directly, often using a credit card. This movement is transformative and its impact is immediate. 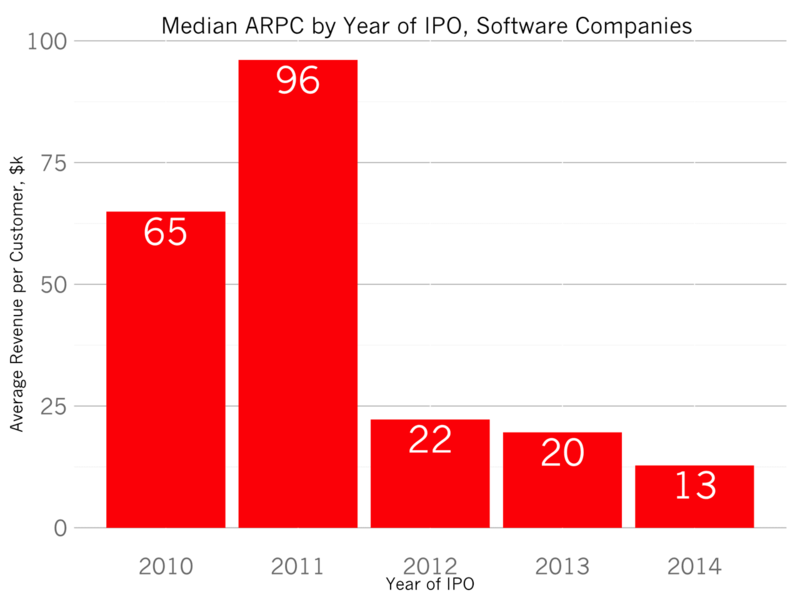 The chart above plots the median Average Revenue per Customer by Year of IPO for the 50 SaaS companies that have gone public in the past five years. The typical SaaS company going public in the last three years has a 77% smaller average revenue per customer than companies in 2010 – 2011. In the past four years, two companies went public with average revenue per customer of less than $1000 (RNG, WIX); and another four went public with less than $10,000 typical customer sizes (ZEN, HUBS, FLTX, NEWR). In contrast, 2011 companies logged a median customer value of $96,000. When these newer cohorts of companies have gone public, they have roughly four times the number of customers paying one-fourth the price of their older brothers. Consumerization of IT is an incredibly powerful trend for SaaS startups for three reasons. First, it exhorts startups to build better products which are easy to use and provide immediate value. Second, this trend demands the the sales process evolve from an education sale to an execution sale, from a push to a pull sales process, where customer support and success meaningfully reduce cost of customer acquisition. Buyers educate themselves with online materials and through product trials (perhaps some contact with support) before ever contacting the sales team, contrary to the traditional enterprise sales process where outbound sales dominates. Third, consumerization of IT enables SaaS startups to acquire customers far more cost-effectively than in the past, which means they need less capital to grow just as big. The Consumerization of IT trend isn’t going to reverse. Buyers prefer buying this way - it provides them more control and less financial exposure. There are no longer locked into large, companywide contracts with particular vendors. In addition, startups benefit by reducing their capital needs and creating faster, more repeatable sales processes, that often look more like B2C sales than B2B. The impact is dramatic and startups have no incentive to reverse course. Over the last three years, consumerization of IT has made an enormous impact on SaaS startups. The first three IPO classes of companies benefiting from this trend have demonstrated billion dollar companies can be built using these techniques. And I’m certain over the next few years, we will see many, many more building businesses on larger numbers of smaller customers.